Someone Out There is Listening tells the story of Eddie Hazell, a jazz guitar player and vocalist with a unique style unmatched in the last half century. Hazell had a combination of good looks, skills, and style. He was a '50s guy - heady, hopeful, and a believer in the system even though it didn't always work for him. As a rising star, Hazell had great bookings across the country and Canada. He was compared to some of the top stars in the music business, columnists and critics gave him solid reviews and high praise for his performances, and disc jockeys played his recordings and were eager for more. People who knew him had no doubt that he would make the big time - it was only a matter of when. 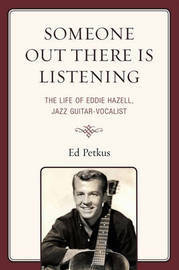 Eddie Hazell's story is about the times and the vicissitudes of the music business, and what it took to accomplish one's goals. Eddie strove not only for success, but to persevere during bad times and personal hardships, while still maintaining artistic integrity and enjoyment of life. Eddie Hazell went the full mile; he didn't leave anything out. The celebrated music producer George Martin once said: "The music business is littered with shooting stars that burned out. So pace yourselves; it's not a sprint. It is more like a marathon. Remember you have to keep running." Eddie Hazell's life is a musical marathon - reading about it is like running with him and the many other runners in his field. Ed Petkus, a New Jersey native, holds a doctorate in social and philosophical foundations of education from Rutgers University and a master's degree in counseling from Montclair State University. He retired from The William Paterson University as chair and professor in the department of educational leadership and currently lives in Gainesville, Florida. Petkus is active in Gainesville civic and cultural organizations and is a member and former vice president of the Gainesville Friends of Jazz, an affiliate of the American Federation of Jazz Societies.